I just want to quickly expand on those few thoughts we expressed in Podcast 47 on the subject of Karen Gillan‘s new Doctor Who companion. Yes, my suggestion of Grunhilda Knobnacker might sound slightly ridiculous (and vaguely rude, in a Slartibartfast sort of way!) but, you may be surprised to learn, I have it on very good authority from someone close to the production team that the character’s name will, in fact, not be that! Yes, not be that. Actually that’s not true at all. I don’t really have any insider knowledge (or links to anyone with such knowledge), so we can all rejoice – it may yet be Grunhilda Knobnacker! Isn’t speculating fun! What about young Karen Gillan herself? Another name that we all said ‘who?’ to. It was Matt Smith all over again! Unlike with Matt Smith‘s casting, this time there wasn’t too much speculation in the press. A few silly names were bandied around, most notably pop star Lily Allen (clearly influenced by the previous choice of Billie Piper – except that Billie had already moved into acting by that point (and was rather good at it, too!)). Despite the muted speculation, her name, like Matt’s, came out of left field. Certainly no one can claim stunt casting this time! Now I must admit I’ve not really seen Karen Gillan in anything yet, a few short YouTube clips of The Kevin Bishop Show aside. But, of course, pretty much every Doctor Who fan has probably already seen her as a Soothsayer in last year’s The Fires of Pompeii. I haven’t rewatched it yet but from what I remember it wasn’t exactly a meaty role, so don’t expect to learn much about how she will play Grunhilda from that. Matt Smith was a little different for my initial ‘who?’ reaction (I heard the name some 20 minutes before it was officially announced on TV) but I did recognise his face when I saw it, though not his name. I had previously seen him in both the Sally Lockhart dramatisations. There seems to be something of a tradition in New Who when it comes to casting companions. All of them (bar Billie Piper, for obvious reasons) have previously appeared in the series before becoming regular companions. By companions here I am only really referring to Rose Tyler, Martha Jones, Donna Noble and Grunhilda Knobnacker. As I said, Rose was a special case as there wasn’t any New Who before her. Donna Noble appeared as a special guest star before landing a regular role (so she still counts, in my book!) Freema and Karen both appeared with minor roles before getting the real gig the next season. I don’t imagine that is deliberate on the part of the corresponding Executive Producer, just an odd twist of fate. I’m sure there were many people interviewed for the roles of Martha and Grunhilda who haven’t previously appeared in Doctor Who (heck, maybe even Lily Allen was among them!) It does go to show the sort of background talent they get in even for minor roles. Of course a lot of people don’t look at Karen’s age in isolation. If it was just her that was, to many of our now older eyes, ‘too young’ then fewer people would complain. It’s when she’s paired with the ‘youngest Doctor ever!’ that people seem to get nervous. Personally I think it is a good move for the Vast Toffee (Master of Nightmares), Steven Moffat, to (apparently) go back to the traditionally winning format of the Doctor and a younger (if only slightly here!) female companion. In future seasons, once Matt Smith IS the Doctor in everyone’s eyes, he can play around with the format. Older companions, alien companions, 51st century kind of companions and virtual companions could all be before us. For now, though, (much as I hate to use the phrase) let’s get back to basics. Matt Smith has one tough act to follow, so let’s not do anything ‘exotic’ straight off the bat. Of course, for all we know perhaps Karen Gillan’s character is rather less normal that she appears in those three official photos we have of her (and those, I presume, weren’t of the character but of Karen). There have also been concerns raised, in part due to their relative young ages, that Matt and Karen’s characters may get ‘romantically involved’ in a similar way to the Doctor (particularly David Tennant’s) and Rose Tyler. It’s a fine line but I don’t really want to see anything quite so overt again, however I do think it is vital that they enjoy each others company. That’s doesn’t mean Matt Smith’s Doctor can’t be stand offish with strangers but I do think he needs to take an instant liking to Karen’s character (and vice versa). Let’s not have a repeat of Colin Baker’s early days with Peri where it looked like they hated each other (why did she stay with him?!) That sort of behaviour is the main reason, in my view, that Colin’s Doctor wasn’t greatly liked by the masses (though I don’t entirely agree with them!) Start lighter and go darker (as they have, to an extent, with David Tennant’s Doctor). We really don’t want to turn the audience off the Doctor because then they will simply stop watching. The biggest barrier to entry for audiences with a new Doctor is the chemistry between him and the companion. It worked with Billie Piper and Christopher Eccleston and again with David Tennant. Her contribution to the success of them both, and the series in general, cannot be underestimated. I don’t think it worked so well with Freema Agyeman or Catherine Tate (at least at first). It didn’t matter in those cases because everyone had bought into Tennant as the Doctor already. This entry was posted on Tuesday, June 9th, 2009 at 20:32 and is filed under commentary, Sci-Fi, tv. You can follow any responses to this entry through the RSS 2.0 feed. You can leave a response, or trackback from your own site. 5 Responses to "Karen Gillan and Thoughts on the New Dr Who Companion"
Somewhere in between your suggestions of Demintia and more sound names ike Megan we find the slightly obscure name ‘River Song’ . Actually River Song herself? Her mind in a new body or does she gain the ability to regenerate (touched by a Time Lord!) at a later date, this being her original self? Interesting idea, this is the Vast Toffee (MN) we’re talking about and Professor Song was his creation. Maybe I’m just over thinking it all – perhaps this is supposed to be a younger version of Alex Kingston? That’s a nice idea and certainly explains why the name hasn’t been released yet. Hard to believe they could really keep it a secret right up until the big on screen reveal, though – too many people will see the 13 scripts (presumably) with her character name on. We’re not just talking the regular cast and crew but also the guest cast, plus the likes of DWM and Doctor Who Adventures. Then there’s the writers of the novels and various non-production team people at the BBC (executives, schedulers, etc.) who may not see the TV scripts but will need to know casting details. Hard to keep a regular character name under wraps but who knows, maybe they can pull it off. Interesting to read these comments from the perspective of 2013. Karen/Amy continued to have devisive camps over how she was written. 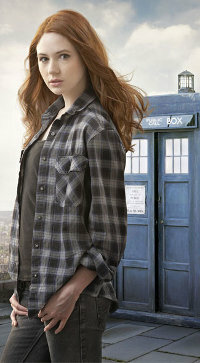 She proved herself an outstanding actress in The Girl Who Waited. In everything else she was less than memorable (again, writing) or even offensive since her character oddly came off as loving Rory (Arthur Darvill’s character) too little. Most telling of all may be that Moffat was pulling OUR toffee with the mystery over the name. And the twist of being River’s Mum along with Rory being a superhero centurion are some of the most awful ideas in scriptwriting. All in all, except for her beauty and The Girl Who Waited Amy/Karen was like a very long, annoying and even painful yawn.